At least some people on Capitol Hill care about moving people from poverty to employment. Those people all seem to be Republicans. Lost in the constant hubbub from Trumpian tweets and liberal media obsessions, Rep. Kevin Brady, R-Texas, and Sen. Steve Daines, R-Mont., last month introduced a bill they call the JOBS for Success Act, to update the once-successful 1996 welfare reforms that President Obama allowed to wither away. This week, they are beginning a long, slow push to build public support for it before the current welfare law expires on June 30. 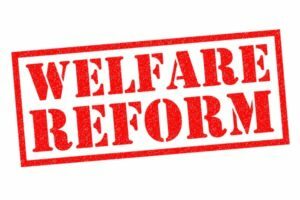 The 1996 reforms replaced the main welfare program, an “entitlement” system known as Aid to Families with Dependent Children, with a nonentitlement welfare-to-work program called Temporary Assistance for Needy Families. As even the left-leaning Brookings Institution concluded after ten years, “it worked.” Welfare rolls dropped by about 50 percent, and eventually by 75 percent. Meanwhile, poverty rates declined significantly, as taxpayers saved hundreds of billions of dollars in a 20-year period. Unfortunately, Obama gutted the program through executive orders and neglect, effectively undermining the work requirements in it. By now, according to Brady and Daines, a full 20 states “have an effective work participation rate of zero” while another 21 have only minor work requirements remaining. Daines and Brady, along with 18 original House Republican co-sponsors, would update and revitalize the program with the Jobs and Opportunity with Benefits and Services for Success Act. First, it would re-require states to engage with all recipients to try to move them to work; and it would measure success not by mere participation in work-related “activities,” but actually by tracking the aggregate “outcomes of getting and keeping a job.” Indeed, the bill specifies a type of easily understandable “report card” to demonstrate success or lack thereof….